A beautiful Friday sunny day to enjoy the weekend in the garden! 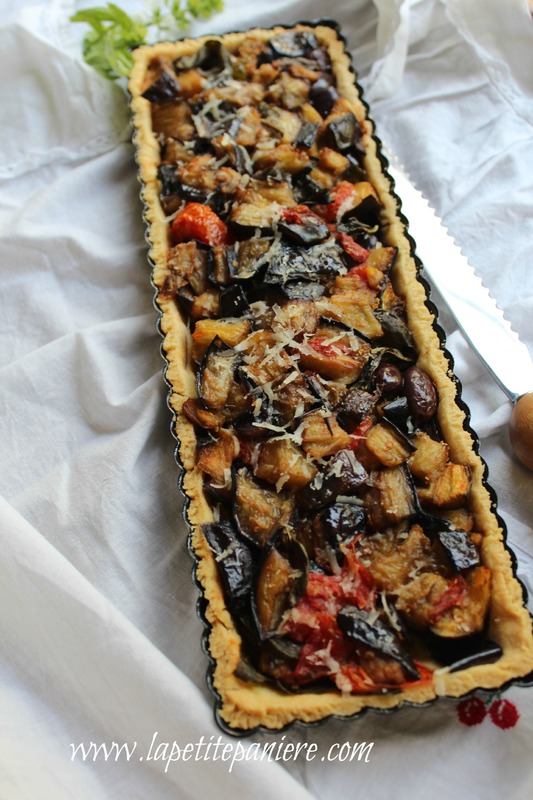 And a delicious salty tart with a lot of aubergine pieces, and some tomatoes to brighten up my dish! To enhance the flavor, I added some fresh basil from my garden. This is my surprise for this week’s Fiesta Friday. A huge thank you to our wonderful host Angie from the Novice Gardener and to our co-host’s for this week; Julianna @Foodie On Board and Hilda @Along The Grapevine. In a large bowl add the flour and the oregano. Start to sift and add the soft butter. Mix with your fingers and add 1 egg. Mix until you assemble the dough. Wrap the dough in a plastic wrap and keep it in the fridge for 30 minutes. Grease a tart pan (a rectangular shape for me). Roll your dough between two big sheet’s of parchment paper or plastic wrap. With a rolling pin, flatten the dough the size of your tart pan. Peel off the parchment paper from one side or your plastic wrap, flip the dough over the tart plate and slowly remove the other parchment paper or your plastic wrap and set aside. With a fork, poke the bottom of your dough and set aside. Wash and rinse the aubergines, the tomatoes, and the fresh basil. In a large pan add extra virgin olive oil (4 tablespoons) and the chopped garlic. Cut the aubergines into small cubes. Chop the tomatoes, and chop the basil. Start to cook and add the aubergine cubes to the pan. Add the black kalamata olives, the chopped tomatoes, and the chopped basil into the pan. Cook all the ingredients until they become extremely tender, and remove the pan from the stove. Add some Parmigiano Reggiano cheese into the bottom of the crust. Pour the filling on the top. Cook the tart for 45 minutes or until the crust is golden brown (depending on the oven). Add some Parmigiano Reggiano cheese on the top for a better taste. The Parmigiano Reggiano cheese adds a lot of flavor to this tart. Now that the weather is great, this tart is perfect for a picnic, BBQ or simply for savoring it in the garden. Wow, this screams perfection!! Just in love with this beautiful savory tart Linda. I had bought some goat cheese the other day and eggplants another time…. but when I went to put the two together for your Goat cheese and Aubergine tart, my aubergine was moldy. Now here’s another winner! I must buy myself that tart pan too, it is just lovely and would be great for entertaining too. Gorgeous! Another excellent recipe of yours, Linda! This could have easily come from a five-star restaurant! I hope my eggplants will give me lots of fruits this year. Or are they vegetable? A vegetable fruit? It’s all so confusing :D. This is just so wonderful, Linda! I love it! Thank you so much Tracey. This is a yummy tart 😉 Have a great week! Such a beautiful tart Linda. I love all the ingredients in the filling! When you call for kalamata olives with the bones does that mean the pits? And I must pick up one of those tart pans. Thank you very much Seana. You right, I mean pits not bones 😀 I just update the page, thanks. Have a great weekend! This tart sounds delicious and looks lovely! Love the tart, I am especially fond of the rectangular tarts, they are so beautiful. Your filling is somewhat similar to caponata, wonderfully delicious. Yum!!! Great tart and photos!! 🙂 Looks healthy too…. Wow – what a dish with lovely seasonal ingredients – thanks or sharing…. It was a pleasure 🙂 Have a great week! Thank you very much 🙂 Have a great week! It was a pleasure Julianna 😀 Thank you for co-hosting this week FF! Oh Linda… this is what I need, RIGHT NOW! It’s nearing dinner time and I can only daydream about this stunning tart gracing our table! Such lovely flavour combinations. This looks amazing, Linda. I need to make a lovely savory spring tart. Gorgeous. Thank you so much Amanda 🙂 Have a great week! Wow!! This is a truly stunning dish. You are very talented! I’ve been craving all of these fresh spring flavors lately and this tart would do the trick! Thank you so much Angie for your nice comment 🙂 This tart is very easy to make and great for an outside gathering. Have a great week! Ha, ha, ha good point 😉 Thank you for your kind comment and have a great week! I’m obsessed with tarts- this is gorgeous. LOVE all of the veggies. Thank you so much Josette 🙂 I’m obsessed too and I love eggplants! What a beautiful tart. It looks delicious! Linda this looks delicious! Perfect for sharing on a beautiful day. Thank you so much Julie 🙂 It was a really nice tart! 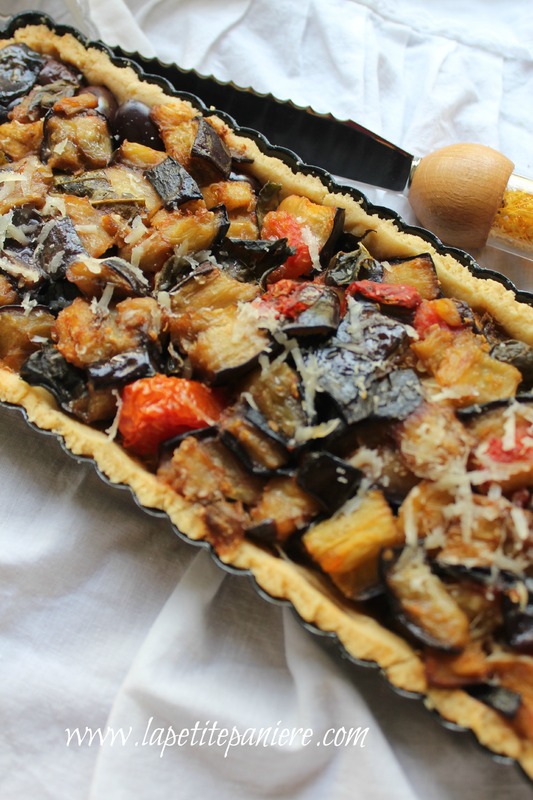 I think I couldn’t live without eggplants, and your tart looks amazing Linda! Linda, You are truly a magnificent cook. I love this simply called ‘spring tart’. It look so good and with delectable ingredients, that I am going to look for this long tart mold to make this dish. Thank you for amusing me with every post.